Register today to attend one of the most comprehensive health & safety events of the season – from the convenience of your own office! Don’t miss this exclusive opportunity to experience our free virtual expo area and learn firsthand from leaders in the health and safety industry about the key trends and technologies that will help you save money, improve efficiency, and ensure compliance in 2010 and beyond. “Inside OSHA Politics” presented by Government Affairs Directors Aaron Trippler (left), American Industrial Hygiene Association, and Dave Heidorn, American Society of Safety Engineers. Aaron and Dave will discuss this year’s important federal and state safety and health legislation and the political landscape ahead of the 2010 midterm elections. “World’s PPE Markets in 2010” presented by Sanjiv Bhaskar, Global Director, Personal Protective Equipment for Frost & Sullivan. Sanjiv will discuss trends in the PPE industry, global PPE markets in 2010, where growth areas can be found, and the outlook in the markets for 2011. Plus more presenters to be announced soon! Each presentation will be followed by a LIVE Q&A session. Don’t miss this exclusive opportunity! 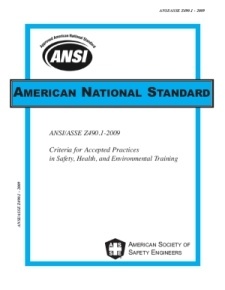 The charter of the American National Standards Committee Z490 on Criteria for Accepted Practices in Safety, Health and Environmental Training was accredited by the American National Standards Institute on April 1, 1998. 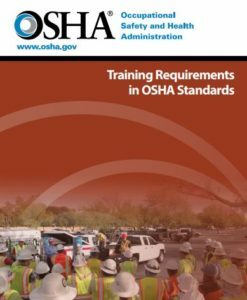 This Standard grew out of the recognized need for improvement in safety, health, and environmental training. Quality training is required to ensure that workers and safety, health, and environmental professionals have the knowledge, skills, and abilities necessary to protect themselves and others in the workplace. Safety, health, and environmental training is an important element of an effective overall safety, health, and environmental program. 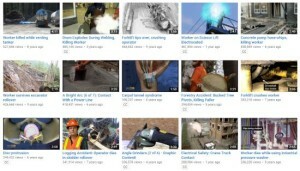 Historically, safety, health, and environmental training has been specifically addressed by only a few regulations with limited scope, such as asbestos, hazard communication, and storm water management. The regulations usually specify the technical topics to be covered in a training course, but do not stipulate how to adequately design, develop, deliver, and evaluate training. This Standard covers all facets of training, including training development, delivery, evaluation, and management of training and training programs. Thus, the criteria were developed by combining accepted practices in the training industry with those in the safety, health, and environmental industries. 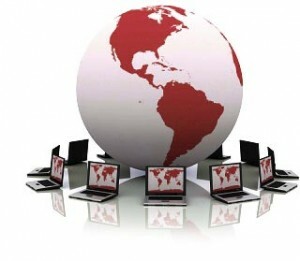 The Standard is intended to apply to a broad range of training and training programs. 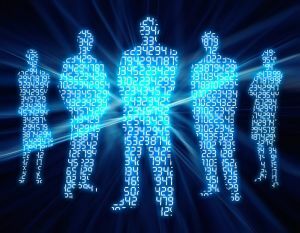 Industry employers may use this Standard to assess the services of external training providers or to audit or improve their own corporate training programs. 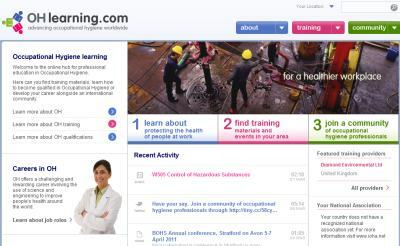 Training providers may use the Standard to assess and improve their training services. 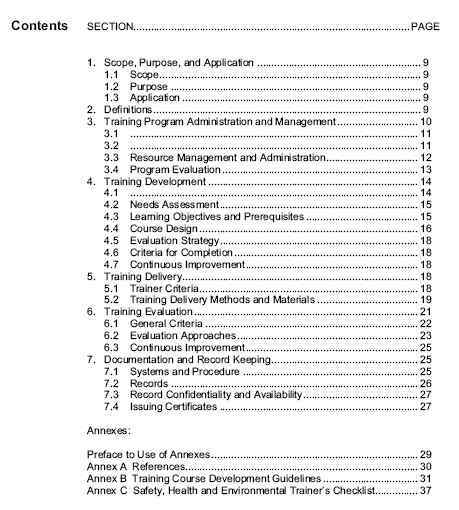 This Standard may also be used as a basis for development and management of training and training programs, with the annexes and references providing additional information and detail. A copy of the Table of Contents is provided below.